230 pages | 5 B/W Illus. In theory, the EU’s ‘Gender Mainstreaming’ policy should mark it out as a trail-blazer in gender equality, but gender equality activists in Europe confront a knotty problem; most civil servants and policy makers can’t understand how to ‘mainstream’ gender. the steps towards positive change, which gender mainstreaming can yield, even when results stop short of ‘transformation’. These findings present fresh perspectives for policy makers and activists aiming to make gender equality happen. 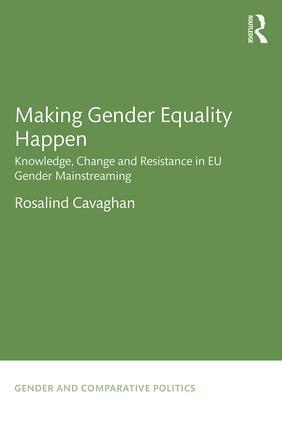 Cavaghan’s new method also opens fresh avenues in feminist EU studies, which are particularly relevant in the wake of the financial crisis, as the EU seems to be stepping away from its commitments to gender equality. Rosalind Cavaghan is a postdoctoral fellow at Glasgow Caledonian University. Her research combines the broad themes of European governance, public policy/global political economy and gender. She completed her PhD in Edinburgh, where she worked as a policy consultant, prior to commencing academic research.